Check out my Book Bub Bargain! Re-Release of 2009 novel, Family Unit. A retired marine, Logan is methodical and conservative. Richard is a liberal pacifist who is pathologically afraid of guns. Yet the minute Logan sets eyes on Richard, his heart turns over like an old car engine and it isn’t long before his motor is revved and Richard is in the driver’s seat–even if it seems like each man is driving a different car. The book is FREE until Sunday. You can either go directly to Amazon or if you’re smart, you’ll sign up for Book Bub Deals at Bookbub.com. I have discovered many new, and new-to-me authors at Book Bub, it’s as easy as signing up for a newsletter and then enjoying the free and discounted reads. The book is available exclusively at Amazon for this deal, so you’ll only need one click to take home Rick, Nick, and Logan today! 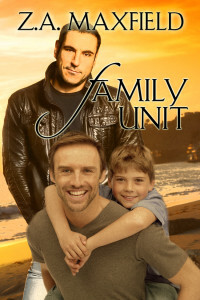 And if you get family unit on Amazon you can get the audiobook at sale price on Audible.com. Who can resist ? HUZZAH! Thanks for reminding me, I forgot about that! The performance by JP Handler is EXCELLENT! This is an excellent book! Great to read about an older couple. Usually after 35 the men are with married hooked up or seace to exist. How about a late fifties couple???? Those that can do and those that can’t read about it. I’m pushing 60 and never been in love. Sad but true. Any hope for me or should I just dig a hole crawl in and pull the dirt in behind???? I can recommend two books that have older couples that are wonderful. Lynn Lorenz wrote a book about a senior couple, the title is: Pioneers, and also, Amy Lane’s book Sidecar. I read both of these so long ago that all I remember is I enjoyed them. As you can see by the dedication in Family Unit, I believe it’s never too late to find your happily ever after! FAMILY UNIT is one of my fave re-reads. In fact, I happen to be re-reading/listening to it for like the sixth time. Just love Richard and Logan. Wouldn’t mind seeing them again (hint, hint). Thanks so much, TPod! So glad you liked it. I don’t know if I have any plans for them. Readers have made some good suggestions!